the last word – Welcome to Spinksville! I wonder sometimes if there’s any player out there who feels that they are actually always lucky with weapon drops. If so, I’d bet good money that they aren’t primarily a tank. Because one thing that every tank I’ve known personally has always complained about was their poor luck with tanking weapon drops. I have a theory about this. (Yes, it is a conspiracy theory!). I suspect that tank weapons do actually drop less often than the loot tables would imply, to make sure there are always a good supply of tanks with which to run heroics and raids because they’re desperate to get their paws on a weapon upgrade. As is true of all good conspiracy theories, I do not have a shred of proof for this. Only the anecdotal evidence of having run Utgarde Pinnacle at least 12 times for my Red Sword of Courage, and I forget how many times I had run Kharazan when the King’s Defender finally dropped. And spare a thought for our poor feral druids, hoping desperately to get their premier tanking weapon of TBC as a random drop from Serpentshrine trash mobs. Of course, the time I got Titanguard from one of our first Ulduar runs doesn’t count. Or in other words, we just remember the unlucky runs more than the lucky ones. 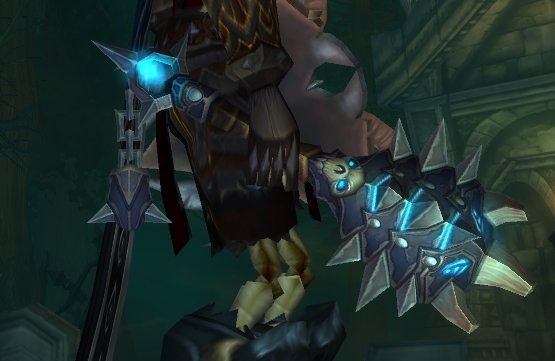 Still, I do think that the distribution of tanking weapons has been an issue in Wrath. They haven’t been evenly distributed between 10 and 25 man, which is why I was using my trusty Titanguard well into ICC. I have been running 25 man raids continuously through Wrath, but I haven’t always had a 10 man group (or fancied PUGging it.) This at least is one thing that will get fixed in Cataclysm when both sizes of raids use the same loot tables. In any case, as you can imagine I was quite pleased when I did finally pick up a tanking weapon from ICC 25. Unfortunately it was The Last Word, which is a notoriously poor tanking weapon compared to the alternative which (naturally) only drops in 10 man. I took it anyway – an upgrade is an upgrade, however dubious – but recently I’ve really started to warm to the poor old thing. It may be a fugly mace with dubious stats and a dodgy proc but it hits like a truck. These two functions generally require different stats. In the cases where one stat will help with both, it’s still not always the most efficient way to gear. So really, as a conscientious tank (with too much time on your hands), you could be looking at every single fight to try and decide if you want to tweak your gear appropriately. In general terms, as the raid moves through an instance and everyone gears up, dps classes generate much more threat. Healers also put out more healing, and tanks get more survivable. Now that the ICC buff is up to 30%, everyone has 30% more damage and 30% more health. DPS threat has increased massively. Tanking threat … hasn’t quite kept pace. If your raid is threat capped, then looking for ways to put out more tanking threat will improve everyone’s performance. And suddenly, The Last Word has become rather a decent option for a tanking weapon. The stats may be so-so, but it still carries a fair whack of stamina whilst the high dps contributes directly to better tank threat.